At the end of the Civil War, Virginian journalist brothers Legh and Frederick Freeman decided to follow the Union Pacific Railroad’s progress to extend its tracks to the West coast with their newspaper called The Frontier Index. The Freeman brothers began their journey at Fort Kearney in Nebraska Territory and followed the railroad across Nebraska, Colorado, Wyoming and eventually to Utah, printing the news from wherever they could find shelter along the way. Advertising and printing jobs – when they could get them — paid their way west. In Laramie, the Freemans set up shop at Fort Sanders but were “booted out” when they made the mistake of writing a less-than-flattering article about the fort’s commanding officer General Gibbons and his southern background. They had rooms built in town and continued the Frontier Index in Laramie through July, when they packed up and moved on to the next town on the line. 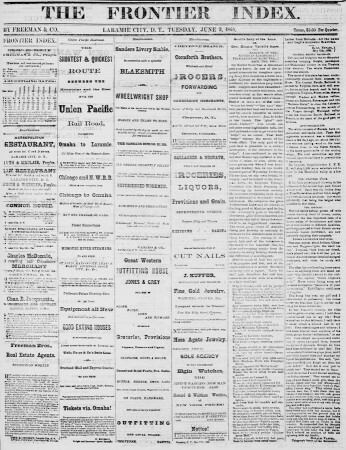 Laramie newspapers to follow included the Laramie Sentinel (1878-1895), the Laramie Republican, the Boomerang and the Daily Times. 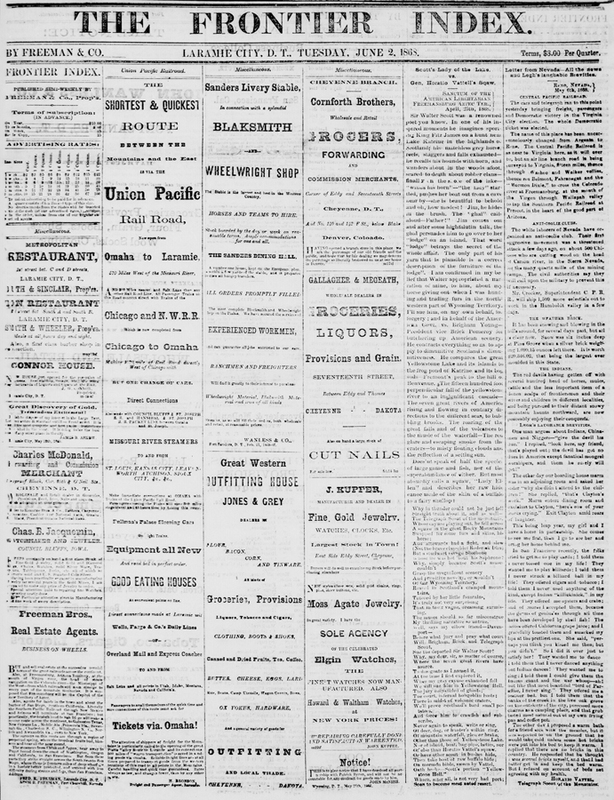 Learn more about the Frontier Index and the early Laramie newspapers.